Susan is a fully qualified and experienced Mindfulness teacher, certified by the Center for Mindfulness, Massachussetts (established by Dr. Jon Kabat-Zinn). 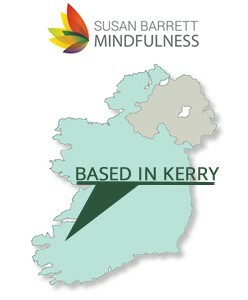 Susan runs a range of mindfulness courses and workshops in County Kerry. I am originally from Dublin but have had the good fortune of living in West Kerry since 1989. I have 3 children ranging from 18 to 25 years and am also involved in the full-time care of my elderly mother. I have been committed to a practice of Mindfulness Meditation for almost 30 years, during which time I have facilitated a weekly meditation group and attended many silent retreats. Susan trained with the Center for Mindfulness at the University of Massachussetts Medical School (CFM) under the guidance of internationally renowned mindfulness meditation teachers, Saki Santorelli, Florence Meleo-Meyer and Carolyn West. Following a period of rigorous coursework and training, supervised teaching and mentoring, Susan was awarded Teacher Certification as an Mindfulness Based Stress Reduction (MBSR) teacher with the Center for Mindfulness. Susan has a particular interest in self-compassion and in 2015 completed a Mindful Self-Compassion training programme with Dr. Chris Germer, of Harvard Medical School. Susan continues to develop her practice by participating in regular retreats and trainings orientated for teachers of mindfulness. She undertakes regular supervision for her work with Dr. Bob Stahl, Director of Mindfulness Based Stress Reduction programmes at Dominican hospital and other medical centres in the San Francisco Bay area. Susan adheres to the Irish Good Practice Guidelines for Teaching Mindfulness-Based Courses developed by the Mindfulness Teachers Network Ireland and the UK Network of Mindfulness Teachers. These guidelines include a commitment to formal mindfulness training with an internationally recognised Mindfulness training establishment, an on-going personal mindfulness meditation practice, engagement in regular supervision, continuing professional development and training, regular participation in meditation retreats and a high standard of ethics in relation to the teaching and practice of mindfulness. In 1983, I qualified from St. Patrick’s College, Maynooth as a Community Worker. I spent two and a half years working and travelling in Asia, during which time, my work including volunteering on community development projects in Kolkata (Calcutta) and on a flood relief scheme in Bangladesh with Concern. Since settling in Kerry in 1989, I worked as a Community Development Consultant with a range of statutory and voluntary agencies throughout Kerry and neighbouring counties, assisting them with change management, strategic planning, conflict resolution and goal setting. I bring over 30 years experience of group facilitation to my mindfulness work. As well as offering Mindfulness courses to the general public, I am also interested in making Mindfulness accessible to organisations, health services, community groups and educational institutions who are providing services in the areas of community development, mental health, education and training. During the 1990’s, I also trained and worked as a practitioner of Shiatsu and Natural Healing.